I wonder why they bothered making this a Neutral card? I didn't notice this agency only text. A bit weird but i think this idea is interesting, are there more cards like this? Not that I know of. It is a little interesting, though. James Logan's best friend. The fact that you only have to exhaust the pistol to use the effect is great, and now that Agency has gotten a shot in the arm from their deluxe box, it should be more playable. Great in the right deck, and just okay otherwise. So overall, not bad. Looks good to me, whilst it has standard attachment problems the fact is you'll often play it when there is already a target present to get 1 quick kill. Agency have plenty of ways to get attachments back so it's a lot less risky or them to use attachments. Pistol vs. Shotgun is an ages old argument and I've always called shotgun, since the deluxe box came out I'm starting to revise that opinion. Pistol is one of the best early game controls that agency have, providing it is attached to a character with at least 2 combat icons. 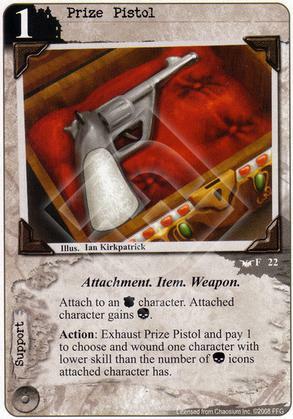 The problem was that agency only only had a single good character they could play first turn to host the pistol. Now that they have both the bureaucrat and Hunter (willpower + toughness) the pistol becomes a lot more consistent and frightening.